Ayurvet Limited is one of Indias leading animal care companies specializing in 100 natural & safe herbal products. The companys portfolio includes herbal healthcare and nutritional products catering to a wide range of animal species. The company - formerly known as Dabur Ayurvet Limited - builds on an expertise with herbs dating back to the 19th century. 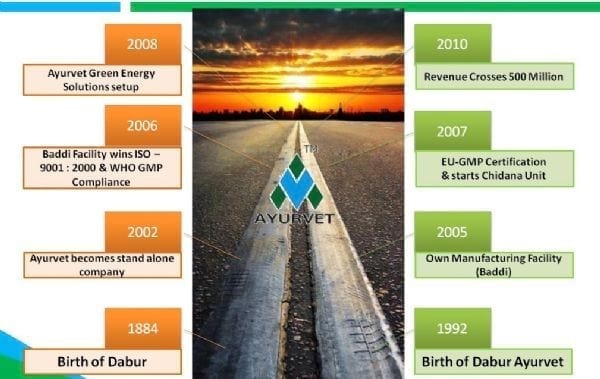 Beginning life as a division of Dabur India Limited - Indias leading herbal based Consumer Goods major - Ayurvet is now a stand-alone company dedicated solely to animal health & nutrition. Ayurvet commenced operations in the year 1992 with the objective of utilising the goodness of Ayurveda to help alleviate the problems of the animal population. Since inception, innovation through intensive research has remained the driving force of the company as it strives hard to prove the effectiveness, safety and sustainability of herbals in improving animal health and production. Quality assurance is the key to achieve high customer satisfaction. Ayurvet''''''''''''''''s activities stem from the firm conviction that the efficacy and quality of products is no accident or coincidence. Instead, they can only come from a well thought-out, planned scientific approach to the collection of herbs, standardization of ingredients, processing of all the raw materials and proper packaging of formulations. Recognising the importance of nutrition in maintaining health, Ayurvet has recently entered the promising area of animal nutrition through the launch of a range of value-added, herbs-enriched quality Feed products. 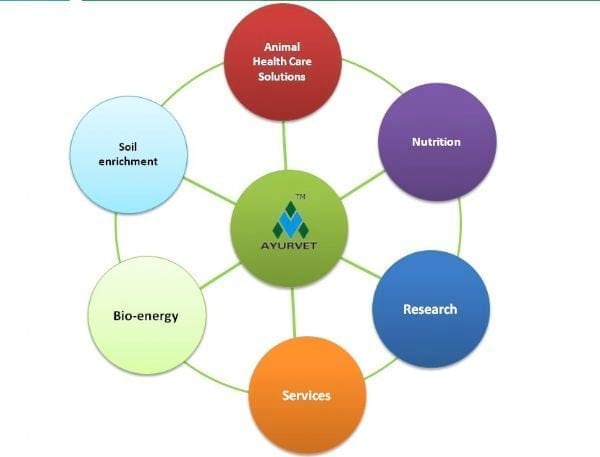 Ayurvet is the only company in India with a portfolio of both health-care and nutrition / feed products. Ayurvet works for a challenging and inspiring mission : "To be the leader in providing safe, dependable and environment-friendly solutions for animal health care"
This mission is the driving force for the company. Ayurvet Limited is a leading herbal animal healthcare company from India. The portfolio of company includes wide range of herbal feed additives/medicines for poultry, Cattle, Piggery, Equine, Pets and Aqua sectors, exporting its products to more than 30 countries including Poland, Taiwan, Thailand, Nigeria, South Arica etc. Ayurvet limited has world class manufacturing unit ISO 9001, EU GMP, WHO GMP compliance it is Recognized Export House by Government of India. Ayurvet Specializes in 100% Safe and efficacious herbal products both feed additive and medici nes, which cuts down the production cost and boost the profit by enhancing productivity of animal or birds. It has herbal replacements for Synthetic Methionine, Choline, Biotin, Vitamin C and Herbal Solutions for Stress Management, Mastitis Management, Complete Mycotoxin Management, Diarrhea, Respiratory Problems, Phytase and Calcium & Phosphorus Supplements with Synergistic Herbs etc. An extended vision to become the world leader in providing innovative safe, dependable and environment friendly solutions for animal health. Besides creating a niche for itself, across the length and breadth of the India, Ayurvet has also made its indelible mark in more than 30 countries, where in it is working with partners. One Stop Futuristic Solution: We are manufacturing safe, efficacious and economic herbal animal healthcare solutions for Poultry, Porcine, Cattle, Equine, Pets and Aqua in form of feed supplements and medicines as well as cater to the need of diversified markets. 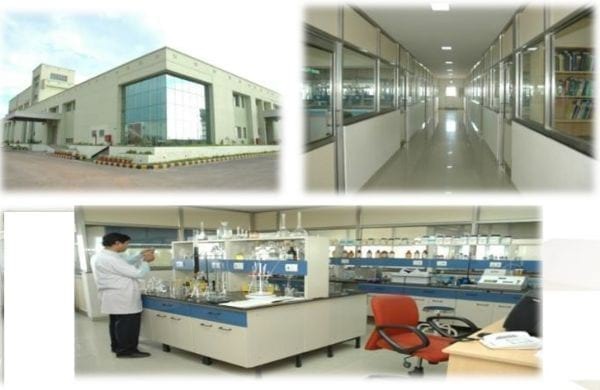 Strong Research and Development: R&D laboratory of the company is equipped with world class state-of-the-art instrumentation facilities to ensure maximum quality. Herbal Healthcare Speciality: Pioneer in herbal animal healthcare solutions backed up by more than 375 research publications in national and International journals. "On an average one research paper published every month since inception"
Scientific Validations: Products are backed by more than 375 research publications in National and International Journals of repute. Global Network: Exports to more than 30 countries ensuring sustainable profits to satisfied customers. Core Competencies: Natural and free from residues ensuring greater bioavailability, Ayurvet products reduce feed cost by replacement of high cost synthetic additives and thereby increase the efficiency of animals to boost farm profits. World class Modern Market Support tools: We have unique Interactive profit calculators which can give you precise estimate profits associated with our products in your farm condition and market prices. It can be customized to support market of our products in specific regions. Professional Marketing Services: Our team is at service day and night to ensure faster and hassle free export of products to your destination. Prompt delivery and customer satisfaction is our prime motto. Awards and Recognitions: Ayurvet, a Government recognized export house, is the first animal healthcare company EU GMP, WHO GMP compliances and maintaining quality standards as per ISO 9001:2008. Besides, Ayurvet is the achiever of coveted distinctions like TERI Award, Agriculture Leadership Award, Golden Peacock Award, Water Digest Award etc.